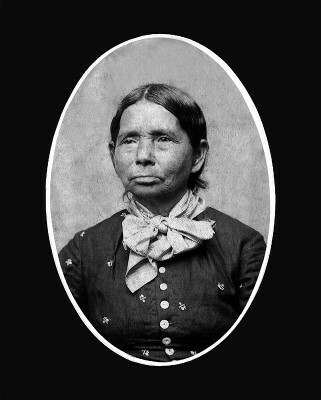 My mother's family, the Conners, donated the photo of Annie Fields [Ballard] to the museum in Tahlequah. I have the original floating around here somewhere but in the meantime, here is a better copy for your scrapbook. The photo file Mary Ann attached to her email was 1546 x 1924 pixels with a file size of 11.9 MB. Being a little too large for quick display on my website, I reduced the size down to what you see here. I also changed it to a Jpeg format from a Tiff format. Both Google Chrome and Mozilla Firefox had trouble opening the .tif file. The original has exceptional clarity. This one turned out fairly well. While normally I do not display other than my own photography on my website, personal connections always make things feel more real. So, I thought the picture she sent was worth sharing. And, as with John Fog Keener (see "he was" link above Annie Fields Ballard photo on main page), many thanks to Mary Ann Casem for freely sharing her heritage. Text shown in quotation marks throughout these pages comes from various brochures, pamphlets, information sheets, other items picked up or photographed on our visits, Cherokee Heritage Center assistance, and Internet searches. See the links pages.